At Four Legs Records, I offer a number of different ways to break down project costs. We can work together on an hourly basis (rounded to the nearest minute), as well as block off half-days (4 hours), full days (8 hours), weeks etc. 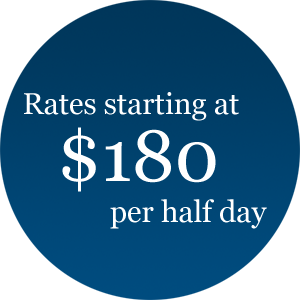 We can also work together on a flat-rate basis, which will need to be estimated based on your specific project needs. For the absolute best results, you should produce your album at Four Legs Records from start to finish. Since having control over the entire process makes things easier on me, I am able to offer discounts for longer sessions. 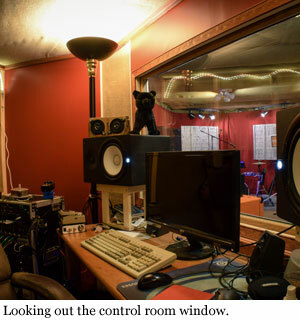 The full production package at Four Legs Records includes recording, editing, mixing and mastering. At the end of the project, you'll have industry-level CD masters that can convincingly compete with any commercial release. 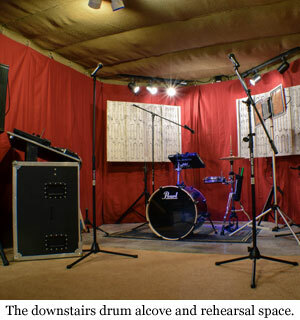 Four Legs Records is a self-designed, hand-built and treated professional recording studio located in the town of Washingtonville; part of Upstate New York's Hudson Valley. The building is a comfortable country house, located far from any traffic or distractions. Parking is free and on-site. I have a kitchen, bathrooms, and guest bedrooms on site, as well as wireless internet access. Here, you can record 24 tracks simultaneously on my Black Lion Audio custom-modified preamps and digital converters. 6 performers can play or sing together or in different rooms, each with their own individual headphone cues. 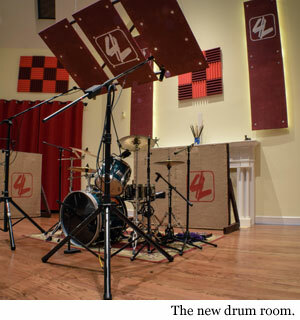 Track drums in the new custom drum room; complete with high ceilings, hard woods, long reflections, customizable acoustic treatment, and room for additional performers. 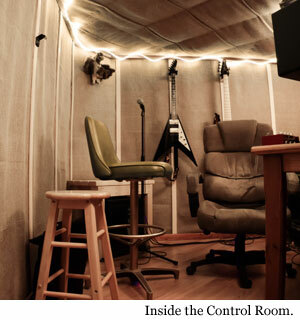 Mic up your amplifiers downstairs in the main room, or keep things quiet in the custom isolation chamber. Record vocals and acoustic instruments in our isolation booth, or perform together along with MIDI instruments in the main room, making use of my minimally reflective recording and rehearsing alcove. My recordings are warm and clear, printed to the most accurate analog console and tape models in the recording business. My editing is precise and clean, whether quantizing multi-track drum performances, pitch-correcting vocals, or just comping and cleaning up your best takes. Instrumental and vocal performances can be manually slip-edited, or time stretched to either match a tempo grid or to better sit with other recorded elements. An entire multi-miked drum performance can be quantized together to avoid phase issues. Multiple vocal layers can be brought into tune with Melodyne's advanced pitch-correction algorithms. Noise can be cleaned up or removed. Quality editing can turn a good performance into a great one. I also offer guitar re-amping services, allowing you to record electric guitars/bass direct on your own or in-studio, and run the signal back out to live amplifiers in post in order to achieve exacting results. If you've recorded elsewhere and just require professional editing services (or more), I can offer both hourly and flat editing rates. Mixing is the part of the process where my product truly stands out above that of the majority of small studios. Have a listen to the sound of drums mixed here, and you'll understand. My mixes are bold, tight, punchy and radio-ready; incorporating precise models of industry-standard analog signal processors, as well as an array of specialized audio tools. It is my personal in-depth knowledge, ear, and experience that puts a Four Legs Records mix in the same class as major commercial releases. My thorough understanding of technical mixing aspects allows us to accomplish any sonic goal. My personal style and proprietary effect chains allow any performer to sound their best. Even an amateur recording can sound like a great one when mixed here. Of course, my high mix-quality standards are most easily achieved with performances that have been properly recorded here. This allows for the greatest level of control and precision in editing and microphone technique. Even if you've partially or fully recorded elsewhere though, bringing your tracks here will take them to another level. My digital mastering process puts the perfect final touch on your tracks. It's in-depth when tweaking is necessary, and more transparent than just about anywhere else when the incoming mix is a good one. 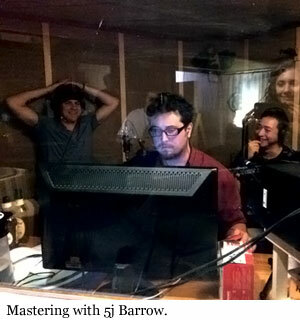 Basically, mastering is finalizing your project so it is ready for distribution. When many musicians look into mastering, they automatically think "making my music louder". Sure, that's usually part of it. Specifically, the mastering process is different for every track, and varies greatly in complexity based on the quality of the mix going in. I might simply saturate and level out one track, and I might need to rebalance various elements of another track. The technical process can be quite complicated, and varies from engineer to engineer. A mastering engineer needs a very experienced ear, good A/B model mixes, and extreme familiarity with their equipment and consumer products. I stand by my technical skill and the quality of my final mastering products. Have a listen, and I believe you will too. If you can't make it over to the studio, I can bring my boutique preamps, microphones, and expertise to your location in order to record on-site. The setup could be as simple as a one-track-at-a-time recording, such as a layered A Cappella recording would require. I would bring a few great vocal microphones, my preamps, and some acoustic treatment to your location to record. Editing, mixing and mastering could then be done later in studio. 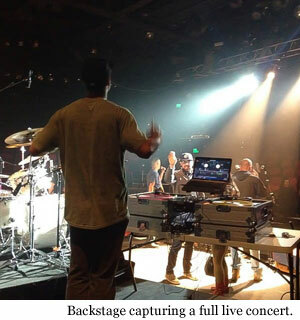 The site recording could even be as complex as a full-band concert album. Provided a splitter snake system or similar, I would bring my array of instrumental and vocal mics and stands to capture up to 24 tracks simultaneously at a live concert. Again, fine-tuning and mixing would be done in studio following the event. I am also now able to live-stream my mixing and mastering sessions over the internet for clients that can't be with me in-studio for the process, but still want to be present and give creative input. I'm just one person trying to be a producer, engineer, promoter, composer, performer, builder and more simultaneously. If you make my life easier by sending other artists my way, I'm happy to reward you with a credit/discount! If you're a client of mine, any time you refer a new (first-time) client, you'll receive a studio credit worth 20% of their total project cost! For example, if you refer a band that records for 100 hours on their first project with me, you'll receive a credit worth 20 hours studio/recording time toward your next project! Alternatively, maybe you're not a recording artist yourself, but happen to be a savvy promoter. If you refer a new client my way, (no close relatives please) I'll reward you with a 5% referral fee once the project is all done! For example, if you do the leg-work and get a band you've heard to record a 100-hour album with me, I'll reward you with a payment equal to 5 hours recording time! If you're interested in referring groups to me, feel free to contact me via e-mail or telephone.